It's all merry and bright, unless you're the janitor. 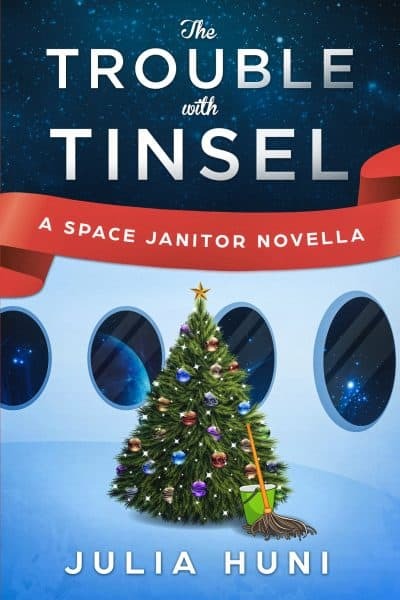 Triana Moore doesn't hate Christmas, but tinsel tidying is terrible. When her bots stop vacuuming, Triana must find out why. Triana Moore doesn't hate Christmas, but tinsel tidying is terrible. When her bots stop vacuuming, Triana must find out why. Like Santa up a chimney, she zips to the upper levels of the space station to apprehend the culprit: a mystery man with a magnetic personality confusing the computers. He can't remember his own name, but he can access the most secure areas of the station with a smile, and not leave a trace. To save Christmas, and the board of directors' all-important holiday party, Triana must enlist all her friends--and a few enemies. When they look in their stockings on Christmas morning, who will find candy and who will find coal?